Jewish power, as I define it, is the power to suppress criticism of Jewish power. This blitz attack was sparked by Labour leader Jeremy Corbyn’s reaction to a mural back in 2012. The mural was painted by US street artist Kalen Ockerman. Apparently, at the time Corbyn defended the public display of the painting on the grounds of freedom of speech. 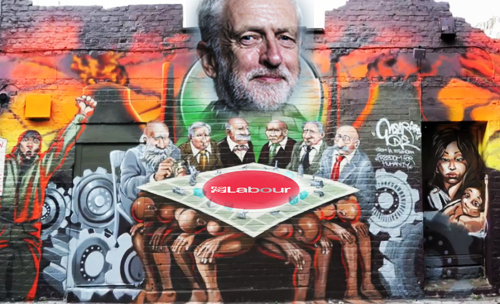 The Labour leader was heavily criticised by Jewish institutions for supporting a mural “depicting Jewish bankers playing Monopoly on the backs of the poor.” The clumsy British media didn’t do its homework and failed to actually examine the mural, but instead immediately delved into the hookedness of the noses of those alleged Jewish bankers. Embarrassingly for them, Ockerman has came forward and identified the men he depicted in the mural. They are from left to right, “Rothschild, Rockefeller, Morgan, Aleister Crowley, Carnegie & Warburg.“ Of the six men, only Rothschild and Warburg were Jewish. In fact, Aleister Crowley was noted for his anti-Semitic views. The take home message for the BBC & Co is that maybe capitalists of all races share similar shaped noses. If you wonder what ‘systematic anti-Semitsm’ means, the Jewish Chronicle provides the answer. In his speech at the protest Jonathan Arkush, the leader of the ardent Zionist Board of Deputies of British Jews, cited Labour’s failure to take proper action on the claims of anti-Semitism against former London mayor Ken Livingstone and other Labour Party members. Zionists do not like Ken Livingstone. This is understandable. The man is a legendary icon of ethical thinking. Despite their protests, it is still not easy for the Labour party to expel one of its legends simply for telling the truth about Hitler’s collaboration with Zionism. Maybe Arkush should just give it more time. Arkush told the crowd that the “the Labour Party must go back to being the enemy of racists—not the refuge.” Of course Corbyn doesn’t have a drop of racism in his entire body, but maybe Jonathan Arkush can meet his own standards and tell us how many Blacks or Muslims are members of his own Jews-only Board of Deputies of British Jews. Maybe the Jewish community leader could try to remember that obsession with justice is not a bad thing and also that interfering with freedom of speech can easily backfire. It is clear why some Jews are upset by Corbyn. The Labour leader treats the Jews as ordinary people. He fails to respect their choseness and ignores their sense of exceptionalism. Perhaps he believes that Jewish politics, like all other politics, ought to be subject to criticism. And now it is clear that Corbyn’s approach to Jewish politics is not acceptable to Britain’s Zionist Jewish establishment. Maidenhead Synagogue Rabbi Dr Jonathan Romain told the JC that this ‘anti-Semitism crisis’ was Mr Corbyn’s “Watergate moment.” I suggest the rabbi learn some Jewish history. This tsunami of Jewish self-love and empowerment could turn into a total disaster as it has time after time in the past. British Jewish leadership is panicking. It has declared open war against a mainstream British political party. This is far from a reasonable move and if it is intended to oppose anti-Semitsm, its effect will inevitably be the opposite. Maybe gestalt psychology offers us the tools to understand such silly behavior. Jewish history teaches us that attitudes toward Jews resemble a gestalt switch. So that, for instance, once you see Israel for what it is you just can’t un-see it. Once you grasp that the Jewish State is a racist oppressive force no one will be able to uproot that perception in you. Jewish Zionists do face a growing wall of resentment. Instead of dealing with it by means of self reflection, they repeat Israel’s mistake and adopt the most oppressive authoritarian agenda. They are desperately trying to turn Britain into an Orwellian dystopia. Left open is the question of how it is possible that the Jewish elite, despite its sophistication and education, never learn from the Jewish past. How is it possible that Jews keep repeating the same mistake time after time? I guess one possible answer is that Jewishness is a form of severe blindness—and that this may be the dark side of choseness. Gilad Atzmon is an Israeli jazz musician, author and political activist. His new book, “Being in Time: A Post-Political Manifesto,” may be ordered from amazon.com or amazon.co.uk. One Response to Enough is more than enough!